In 12-inch skillet, cook beef over medium heat 8 to 10 minutes, stirring occasionally, until no longer pink; drain. Add water, salsa, beans and taco seasoning mix. Cook 3 to 5 minutes or until sauce thickens. Reduce heat to low. Stir in tortilla strips; cook 1 minute. Top with cheese; cover, and remove skillet from heat. Let stand 3 to 5 minutes or until cheese is melted. Top with green onions. Serve with sour cream. Flour tortillas have a sturdier texture than corn tortillas so are used to make stuffed burritos—and make sense in this deconstructed burrito skillet. But for a crisper texture in the dish, cut corn tortillas into narrow strips, and lightly sauté them in a generous splash of olive oil in the skillet. Set the crisp tortilla strips aside while you proceed with the recipe—then replace the flour tortilla strips with the corn tortilla strips. Create a small condiment bar to serve alongside: In addition to the green onions and sour cream, set out small bowls of chopped avocado, fresh tomato salsa or pico de gallo, and fresh sprigs of fresh cilantro. Serve a salad of orange segments and sliced radishes tossed with watercress or torn butter lettuce, dressed with a tangy vinaigrette. There’s a reason that ground beef skillet recipes are such favorites with time-pressed home cooks. The beef takes just a few minutes to brown, and it can serve as the perfect backdrop for any number of ingredients and types of cuisines. 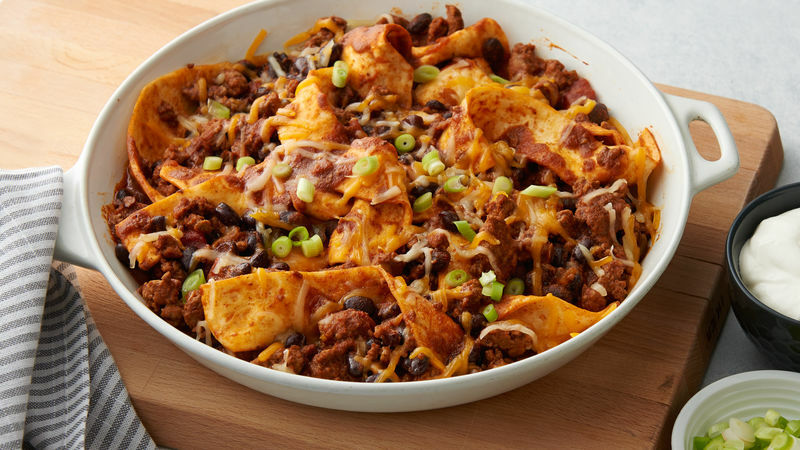 In the case of this easy beef burrito skillet, a few Mexican-themed ingredients can turn plain ground beef into a deconstructed burrito that satisfies hungry appetites. Feel free to mix and match according to your family’s preferences. You can switch a can of refried beans or pinto beans for the black beans, or try additional mix-ins like olives, canned green chiles, thawed and drained frozen spinach or cooked frozen corn. The recipe is also delicious if you swap corn tortillas for the flour variety. If this easy ground beef dinner recipe has you interested in trying more variations, check out Betty’s best burrito recipes.